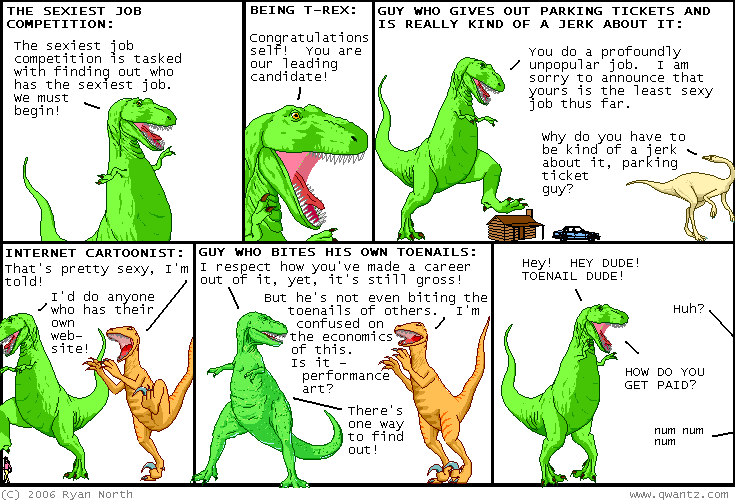 Dinosaur Comics - June 15th, 2006 - awesome fun times! June 15th, 2006: Hey, have you been reading my book? Have you been enjoying it? If so, awesome! Thank you for buying my book and I'm glad you've been enjoying it! One thing you could do (if you wanted) was to go down to your favourite book store and ask them if they could stock the book. They'll probably want to know the publisher information and ISBN, which you can find by clicking on these words here! It would be great if the book was in more stores (especially in the UK, where it is not currently in any stores! ), because that means more dollars for me, and, as you know, my pupils are already little dollar signs.